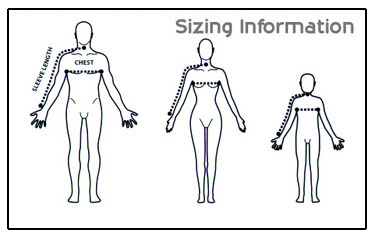 Please note: We encourage the use of sizing samples to have a more accurate sizing for our styles. 1. Chest - Under the arms and across the shoulder blades with a firm and level tape. 2. Hip - When standing, measure around the widest part of the hip..
3. Sleeve length — Relax arm, and measure from the centre of the back of the neck, over the shoulder and down to the outer wrist.